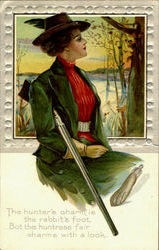 Times passed, imagine getting dressed up like this to go hunting for Sunday’s dinner! The hunting season here is starting soon, the hunters and their dogs have been looking around our area for any signs of rabbit and hare burrows or the beautiful pheasants that they might catch a glimpse of. I dislike immensely the sounds of guns,whistles and hound dogs on a Sunday morning and with that -No further Comment! Chicken cacciatore is one of the dishes I remember when I was little, but I can’t remember anyone mentioning this name. After reading the ingredients of this recipe some time ago and making it more than once, and after tasting the flavorsome sauce it all came back in a flash of tingling taste buds. Cacciatore is Italian for “hunter”, and refers to the heavily flavoured sauce that covers the meat. Cacciatore (the original recipe) composed of onions,mushrooms,herbs and chicken or rabbit and would have been the main dish of the hunters expedition,maybe a wild,wet and windy day just like today…. A slow stew. As wild game tends to have a certain “taste” the bold flavours of the hunters sauce, and the long cooking time,we’re talking a couple of hours my friends achieves the desired tenderizing effect and covers the taste of the meat.We’re talking meat falling off the bone.It’s that tender.However I don’t overcook mine. Today, chicken cacciatore recipes are a mixture of slow cooker, modern techniques and ingredients and a touch of the old world seasoning . 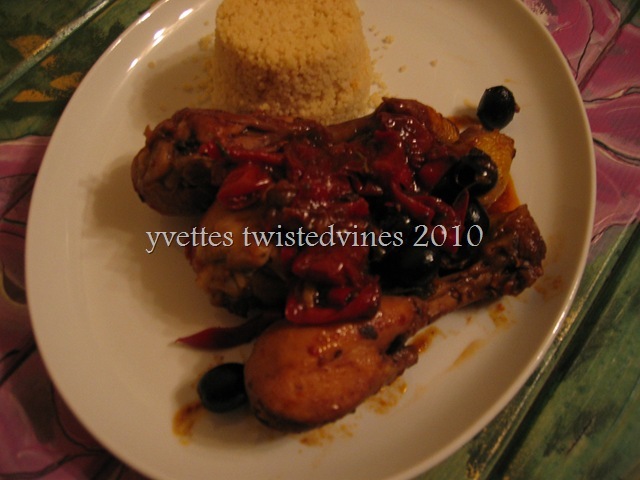 I have made this recipe also with rabbit but chicken is the easy alternative.My version of this recipe does use tomatoes and tomato paste, diverse from the original. * Heat oil in frying pan and brown chicken in batches, drain on absorbent paper. 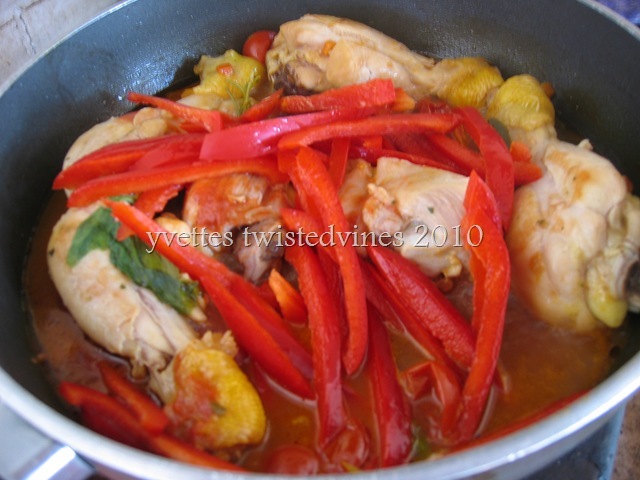 * Fry onion,carrot, celery and garlic in a tablespoon of olive oil, cook until soft.Add the chicken,chicken stock,white wine,tomatoes,tomato paste, herbs and red capsicum.Cook for 1 1/2 hours on a slow simmer. * In the last 1/2 hour of your cooking time add the pitted black olive and cook uncovered for a further 10 minutes. The sauce should be thicken,discard the bay leaf and serve with polenta,rice,pasta,fresh crusty toasted bread or as I did i served it with cous cous anything that’s going to soak up that lovely richly flavoured sauce. 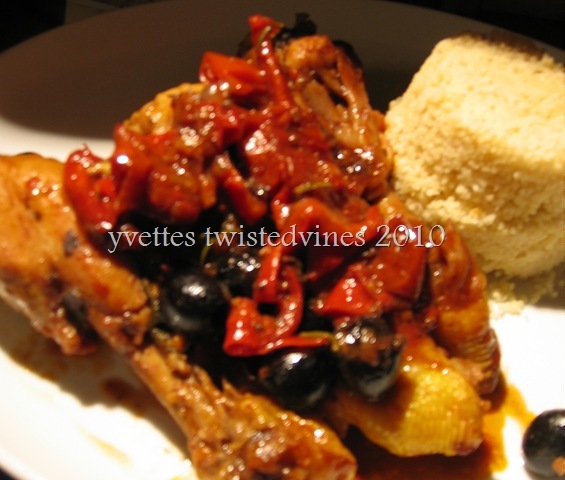 A hearty meal with a rich tasty sauce…Chicken Cacciatore. One of the things I love about your blog: the ingredients and vocabulary that is new to me. I had to look up “capsicum” (which I call “red pepper”) and “tomatoes palate” (I think that must be what I call “whole tomatoes”). I’m definitely going to give this one a try! Your right about the tomatoes, whole they are!I’m finding that more too as I read other blogs, English,products and measurements are all so unique …I enjoy hearing comments so I hope my blog isn’t too much of a challenge!Chicken Cacciatore is a wholesome meal,I hope you enjoy it!